What do robots, 3D gaming, BBC computers, podcasting, zeer pots and cooking stoves have in common? Judging by the evidence, albeit anecdotal, at the gadget show live in Birmingham today the answer is there is something about technology that either interests you or it doesn’t. This doesn’t depend on the age of the technology or the person. Technology is of interest to a wide group of people, albeit that most were “dads and lads”. It became clear that a person’s interest in gadgets also gave them insights into the challenges and opportunities posed by introducing technologies into developing countries. My pre-show scepticism appeared to be unfounded…it was a really worthwhile day: from a personal point of view in terms of the rich conversations I had; and from a professional point of view in terms of the contacts I made. This is ample demonstration that an organisation like Practical Action sometimes needs to take well judged risks in order to reach audiences that have hitherto appeared uninterested, or unaware of our work. Our special 3D glasses were a big hit with kids and all agreed that they gave a 3D view without the aid of electricity – an interesting juxtaposition with the nVidia stand across the aisle where people had to wear special (hi-tech) glasses to see the screen in 3D. The cooking stove was a big hit with visitors from Nigeria and neighbouring Cameroon amongst others. All were deeply touched by the health hazards from smoke in the home. The humble mp3 player coupled with a solar charger captured many people’s imagination. Most people guessed the function of the zeer pot and instantly appreciated the way in which such technologies could be adopted locally. Those interested in camping wanted a solar lantern for their tent. Gadgets for you or for all? The gadget show live at the NEC is expecting 100,000 visitors. All, no doubt excited by the prospect of ever newer faster, smarter, smaller gadgets that will transform our daily lives. Or will they? To truly transform our lives there would have to be some quantum leap in functionality that the gadget could deliver. But this is unlikely to be the case with most of the gadgets at the show. Most of the visitors will, I imagine, already have a digital camera, a music player, and a mobile phone. So will the newly acquired gadget simply be a fashion accessory? What would a gadget do for someone living in poverty in a rural area of Nepal or Zimbabwe without access to electricity? Here a gadget may enable a family to access clean drinking water, irrigate their crops or cook dinner without creating smoke that would damage their health. The key difference between “them and us” is that for “them” there is often no choice. There is either no money to buy a gadget or no gadget available. For “us” the choice is almost too much…overwhelming amounts of gadgets, with varied prices and functions. On visiting iHub Nairobi’s Innovation Hub there were many reasons to be impressed. Not only was the office layout, clean, open and free of the uncreative structures of the modern office environment but there was also a definite and unpremeditated energy of enterprise, entrepreneurship and development. ‘Social Media Club, if you get it, share it. In terms of my visit to Kenya and the work of Practical Answers as the knowledge sharing function of Practical Action this phrase is so, so relevant. We as Practical Action do get why, how and when ‘technology’ is an appropriate function of development. In fact it is exactly what we have been doing for over 40 years. Who is driving Innovation in International Development? What place could iHub play in creating change through Innovation? Why is this connected to development in Kenya? Where should we start to innovate? When can we achieve results? How can Digital Innovation aid the cause of Practical Action? These questions need to be amplified within the development agenda, particularly within Kenya and East Africa. The rise of the mobile phone over the last 5 years and the need to be connected to both mobile, internet and social networks 24hrs a day is clearly a priority for a large % of Kenyans in 2011. I am not going to begin to answer how, when or in what shape digital ‘Innovation’ will play it’s part in the development of East Africa and indeed International Development Globally, but it is fundamentally clear and simple to see that we need many more iHub’s in the world to begin to start on solving the major world issues that we have today. In consortium with the World Wide Web Foundation, please check out iHub and indeed m:lab and support the work that they are doing in encouraging the rise of Innovation, Investment and creativity within Kenya and East Africa. Following a meeting on our second day in Nairobi a conversation really resonated with me. Now in 2011 these needs are only the basic bare necessities of life, there is a hunger for, a want, and a very real need for Information. These are all now as important as the basic needs for all. How will we as the modern world deal with this as a need? On meeting Alin a dynamic Kenyan organisation who connect communities with knowledge throughout Eastern Africa it is clear that knowledge is now key, in fact knowledge is freedom and power. Alin works to disseminate knowledge and feed that knowledge into communities that need it. What is clear is that we need to value knowledge as important as air. Knowledge is the 21st century fourth component, the way of life. Life as we know it has now changed and we need to embrace that change. This is where Practical Action and Practical Answers is so important! Our work on podcasting in Zimbabwe has just received global recognition. The Finalists in the prestigious Stockholm Challenge have been announced today, 1 December 2010. Our project has been selected by a panel of independent international judges. More details about our entry can be found on the Stockholm Challenge 2010 website or on the Practical Action site. Many congratulations to the team in Zimbabwe led by Lawrence Gudza. Has science failed (the poor)? This was a question I was asked after a talk given at Chatham House on Monday. The talk was part of a two day conference on: Investing in Science – Securing future prosperity. Although I had been critical of science for not directing effort towards the global grand challenges of energy poverty, water scarsity, and food security I do not believe that science has failed. Rather, as a (dismal) scientist might say; science is a necessary but not sufficient condition for development. My argument was that “how” we engage science and scientists with development challenges needs to change. We need to include wider stakeholder groups such as local (developing country) scientists with global scientists; we need to engage local business with local business; and importantly we need innovation in business models. Many people at the well attended event came to talk with me afterwards to say that they agreed with what I said. Clearly that statement is not based on scientific evidence but it is encouraging nontheless. 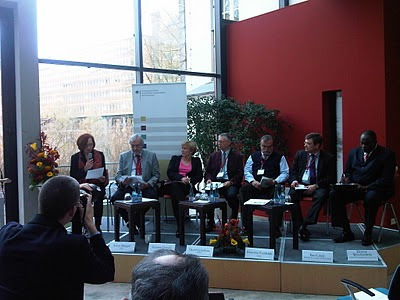 A conference held in Berlin last week heard from a variety of experts on the use of ICT for development. It was disappointing that much of the time was spent discussing technology-led projects. Towards the end of the conference the panel – see the photo – were agreed that a focus on information needs and business models are the way forward. In other words, the D in ICT4D needs more emphasis so that we are clear about how and why information can lead to positive impact. At the same time recognition of unintended impacts from technology should be captured to provide evidence for what works and what does not work. More can be found in the IFAD blog. Sometimes I think or maybe hope the Small is Beautiful message has won through and we are a world that thinks in terms of appropriate, local and increasingly sustainable. At other times articles such as the one below burst my optimistic bubble and prove again how far we have to go. A sad if mad start to Monday. This is a snippet taken from a Canadian newspaper where an influential conference on energy is taking place with 5,000 international delegates. MONTREAL – Space exploration may pay off in the quest for renewable energy supplies for all of the globe’s inhabitants, the president of the Canadian Space Agency said during opening ceremonies at the World Energy Congress in Montreal. “There is a tremendous amount of energy out in the universe,” Steve MacLean said during a speech that urged delegates to look beyond the boundaries of Earth. That untapped energy is manifest in such things as black holes, said MacLean who circled our “fragile yet resilient” planet during space missions in 1992 and 2006. “We know that black holes exist … that they drive our galaxies but we don’t fully understand them (yet). But the important thing to recognize is there is more energy out there on the head of a pin than you can imagine. We have less than six years to turn our planet away from its addiction to carbon intensive fuels and yet 50% of the world’s population have no access to decent, modern energies. The solutions are not in space, they exist now. The problem is that we pretend as with this article that miracles of technology will save us and that we don’t need to act. Remember the saying no pain no gain? This applies to our planet and to our energy use. Maybe black holes will have a use but we can’t rely on them and they certainly won’t be part of our energy mix as we envisage the next 20 years – imagine the length of the pipeline? Get real. Where is the nearest black hole? No rude answers please. Who needs a $35 laptop? When rumours of a $100 laptop circulated back in 2005 great excitement was generated. Yet if we now measure success against the targets that were set, the endevour has fallen short in a number of key respects. When Nicolas Negroponte revealed the idea in January 2005 he estimated that 150 million would be shipped by 2007. By the end of 2009 Kraemer et al (2009) reported that only a few hundred thousand had been shipped at a cost of $199 each. Top down technology development that has largely ignored inputs from local people. Hardware led with the promise of software later. This is problematic in the area of education where usage will be dependant on good material being available and on teachers having the skills to embrace the new technology. The business model is not sustainable. A large amount of resources are being allocated to fund devices with limited lifetimes (say 5 years) with no funds for replacement. So how does a $35 laptop announced this week in India address these issues? The lower cost is certainly good news. The device will be running open source software…further good news. Importantly for the update of the device in developing countries the battery will be rechargable via solar power. The touch screen technology will also help in making the device more intuitive. Does it have a voice interface, allowing local languages, I wonder? However, there remains some concern about the availability of software, local language materials, and skilled teachers. But let’s be clear…the initiative comes from India…so there is credit due for the development of a technology to fulfil local needs. It is also at a price point that compares with a mobile phone…and we know how quicly mobile phones have been adopted by poor people. Earlier this week a diverse group of students, academics and others gathered in Cambridge for a crash course in synthetic biology…a sort of synbio 101. You might exepect the discussion to be rather technical…you would be wrong. Questions that were asked included: “how can scientists help the public to envisage the future? ; how can we consult the public in a meaningful way to find out what choices they would make in terms of future directions for science?” These and other questions indicate that the scientists are taking their social and ethical responsibilities seriously. In 2009 a Cambridge team won an international competition: iGEM 2009 for the development of a bio sensor. Such a sensor could have many real world applications including the ability to detect arsenic in drinking water. There are many design and other challenges ahead for this to be taken up by the people who need such technology. For example, at a workshop held by Practical Action in Nepal in 2009 local communities expressed a need for a digital display rather than a colour gradation. After my talk about how new technologies can be developed to meet the needs of poor people rather than just market wants there were many more questions. In the end there was an enthusiasm for rising to the challenge I had given them…the challenge of dialogue and engagement with local communities, local scientists, and local business. This was the beginning of a fierce conversation. Remember every change in the world starts with a conversation. Together we can make change happen.